In 1995 Jolanda van den Berg, at the time 30 years old, went to Peru on vacation. While in Cusco, the old Inca capital, she was stricken by the smarting circumstances in which many children had to live. In primitive hovels, often without a father or with a father with a drinking problem and a mother totally unable to take care of them. The children were often left to take care of themselves. Young children roam the streets all day long in order to shark up a meal. They structurally met with ‘domestic’ violence and are totally neglected in all aspects of life. Once back in the Netherlands Jolanda could not forget what she had seen, Six months later she therefore decided to leave hearth and home and take domicile in Cusco, without a structural plan, without any money and without speaking a word of Spanish, but with the intention to help children and with the firm conviction that she would succeed. Meanwhile she more than fulfilled this aim. In the first instance Jolanda literally picked twelve boys from the street to take care of them. The youth court magistrate gave her parental control until their eighteenth birthday so then they could be a family. Jolanda’s mission, as is also the Foundation’s mission, is to create a better life and a better future for as many chanceless and neglected children in and around Cusco as possible. Her starting motto: “if I can only help one” has remained a stimulus. In the meantime she helps more than 600 children per day and the number is still growing. The Ninos project has become an institution in Cusco and Jolanda is still the driving force. In addition to those 600 kids she has also helped 80 Peruvians to get a job. These people are necessary to keep the ever increasing organization on the road. They, in turn, are able to support their families so that 80 can easily be multiplied by 5. At the moment a total of 1000 people benefit from the fact that Jolanda ever took the courageous step to leave for Cusco. In order to be sure of a constant source of income Jolanda not only founded the Ninos Foundation, but she also started a hotel, the proceeds of which all go to this project. In 1998, aided by a generous sponsor, Jolanda could start her own business company "Ninos Hotel" and buy an old colonial building in the heart of Cusco. Her wish to create her own source of financing the Ninos project became true when she was able to buy this pleasant and big building: the Ninos hotel situated at the Calle Meloq. Moreover she could then go and live in a part of this building with her 12 Peruvian boys. The hotel soon became very successful. Tourists from all over the world find a lot of pleasure in staying there. A short while later and with the income from this hotel plus donations from the Netherlands Jolanda was able to procure a site on which her first children’s restaurant was built. On this site many more children than only her twelve boys could get a meal and also attention, safety and the opportunity to play and to be educated. 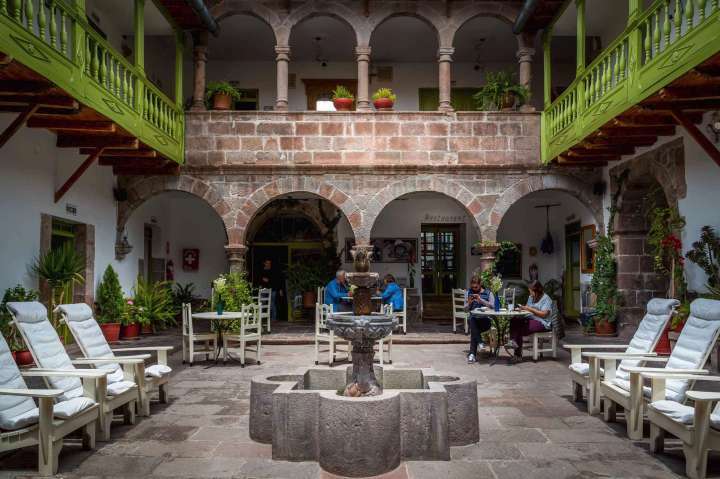 In the meantime, after fifteen years, there are five children’s restaurants, two hotels in town and an hacienda with horses outside of Cusco. This hacienda is situated in an idyllic spot half an hour from the town in the midst of the mountains. Furthermore also on the sites of the restaurants for the children, there now are a sports hall, two libraries and a small cinema. 150 construction workers have found work for the next ten years to build or restore all these projects.